Here are some of the cards I made this weekend. 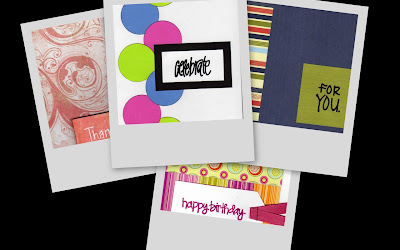 I made all of these cards using the scraps of patterned paper & cardstock that I had on hand. Making cards is so much less expensive than buying them. I am sure everyone has certain things that make them smile. I like to keep things close to me while I am at work that cheer me up. My workplace is stressful and having these things near me help. I don't have much room on my desk so I have a bulletin board next to my work space that has a bunch of my favorite photos. The one happy thing that will always be on my desk is my cow. Yes, that brown lumpy piece of clay next to my phone is a cow. It is one of my prized possesions. This cow was given to me by my nephew. He made it in art class when he was in elementary school. I was talking to him yesterday (he is now 15) and told him I still had that cow on my desk (I think he was surprised). There is just something about this little piece of art that makes me happy. So Thomas, thank you for making Aunt Sandra smile today. I am teaching a class on Saturday at Scrap Paper Scissors (Winter Garden, FL). In Saturday's class we will be making a pop up scrapbook using the Basic Grey Two Scoop's line. Please contact the store for more information. Today's blog prompt on 2 Ps is about journaling. I have scrapbooked since high school but when I really got into the hobby was after going to a couple of Creative Memories demos. In these demos I was taught that scrapbooking was really about the story that your photos tell. The CM philosophy was photos first, then journaling, then add embelishments as a final layer. I eventually broke away from the CM way of thinking. While the photos and journaling were still important to me, the overall design of a page is what brings me the most joy. I used to mandate that there be journaling on every page. Sometimes, the journaling didn't have much substance. Now often the only journaling on my page is my title and I am ok with that because sometimes that is all I need. Well, this week started off on a sad note for me. One of my dear co-workers lost her mother rather suddenly over the weekend. From what I have known this woman was very warm and caring. She had a large family (including adopted family members) and was the very much loved matriarch of the family. I went to the viewing last night with two of my other coworkers so could show support for Dottie and her family. I should stop here and tell you a little bit about Dottie. I have worked with her for about 4 years now and I just think she is terrific. She is warm, funny, and always willing to help you out. Dottie has a lot of siblings (10 total) and family has always been very important to her. This past Christmas was a big one for her family because everyone was coming into town for a family reunion. Dottie talked about this reunion a lot last year and was always saying how excited her mom was about it. Dottie wanted to give her mom a special Christmas gift since it was such a special occasion for her family. Her plan was to put together a large scrapbook of family pictures for her mom. The project became a little to much for Dottie to handle on her own so she enlisted my help. I put together a 50+ page scrapbook for that included pictures of the whole family. In someway, I think I got to know her family while I was making that book. Dottie’s whole family loved the gift. Dottie even told me that her mom would sit and look through the scrapbook over and over again. It was her life in a book. Because of this it seemed only fitting that they included this scrapbook in the service for her mom. So this week Dottie and her family will definitely be in my thoughts during this difficult time.